The next evolution in home energy storage is here! The second generation of Tesla Powerwall (still referred to as Tesla Powerwall or just Powerwall) is Tesla’s newest home solar battery. Installs have already begun! What makes this solar battery so significant? Tesla Powerwall 2 has an incredible 13.5kWh of battery storage, double that of its predecessor, in a smaller unit! The solar battery stores your excess solar power and/or cheap off peak power from the grid to allow you to supply your home with cheap, environmentally friendly power during the night and early hours of the morning. In other words, it’s purely designed to save you money. 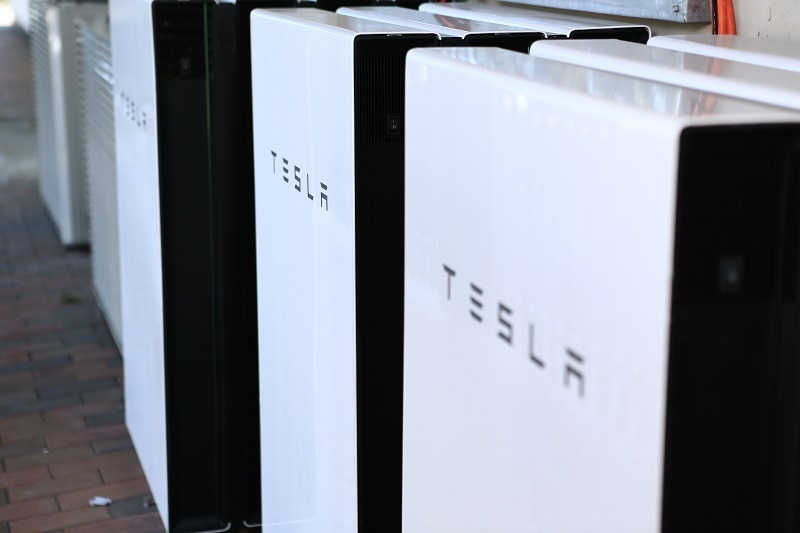 Tesla Powerwall is a battery primarily designed to store power generated from solar panels. When it’s needed it will feed the stored energy into your home, so it’s perfect for night-time, power blackouts or even when it’s cloudy and your solar system is not performing to maximum capacity. Maximised solar self-consumption – Utilise your solar generation to its fullest to reduce your bills significantly. Only export power to the grid when home loads are covered and the battery is fully charged for night time use. Use solar generated power all day and all night! Time of use load shifting – Use your power at night to save even more money! Back-up power functionality – Blackouts and brownouts, are a thing of the past. Never be without power! Employment in ‘Off-Grid’ Solutions – Perfect battery for use in solar single phase off-grid solutions! In the event of a blackout, Powerwall will feed the power stored in the battery back into the home until it’s depleted. When paired with an appropriately sized solar system, there should be enough charge in the battery to get you through the blackout until the morning. No more food going to waste as the refrigerator stays on! For those who get semi-frequent brownouts, with the addition of the Tesla Powerwall Backup Gateway, your solar system will still operate during a brownout, providing power to the home loads first, then storing any excess in the solar battery with any shortfalls in power required by the home not being generated by the solar system being covered by the battery itself! Boasting a generous 10 year warranty, Tesla Powerwall home battery has been designed and the warranty set out for the battery to be cycled daily (the process of charging and discharging) and with its generous 13.5kWh of battery storage has enough energy storage capacity to power a typical family home* with a little left over. Homeowners can virtually go off-grid, paying mere peanuts to their energy retailers for the little power, if any, which might be required. With a single Powerwall, you could power a typical two bedroom home for the entire day*, free from grid power, utilising your own environmentally friendly power. Tesla solar battery is available as an AC-coupled unit with its own battery inverter. What this means for homes without solar – You don’t need to purchase an expensive hybrid solar and battery inverter. You are able to choose any inverter you like. Power optimisers, micro inverters or standard inverters (we sell them all too!). What this means for homes with existing solar – You don’t need to throw out your existing inverter and have it replaced to take advantage Tesla Powerwall. Even better, you can add additional solar at any time and this will still be able to flow into Tesla Powerwall before any energy is exported to the grid. It’s also sleek, compact and stackable (up to 10 units), can be floor or wall mounted, indoors or outdoors. Finally, it can be added to an existing solar system as a ‘retrofit’ unit or as part of a brand new solar system and battery combination. *Based on data from the Australian Bureau of statistics, 2014. Avg National household uses 5,817kWh per year. Using trend of energy use reduction of 12.5% per year, average daily use in 2016 is 12kWh per day. The battery saves you money by reducing your usage of power from the grid, even when the sun isn’t shining! 13.5kWh usable in each battery and scalable – stack up to 10 units for a huge 135kWh of storage! Solar produced is used by the home first, with any excess charging the battery. When your battery is full, excess solar not used by the home is exported to the grid to get a FiT (Feed-in Tariff). Use the stored power at night or as your home needs a boost to reduce power drawn from the grid. Backup power functionality – Keep the lights, tv and refrigerator on! When your battery has been fully drained your home will be powered from the grid. 10 year limited warranty – covers 10 years of daily cycling or 3,650 cycles, whichever comes first. Monitor the status of the battery via the App or online monitoring portal. No maintenance required. Add to an existing or a new solar system seamlessly. The battery will get regular software and firmware updates directly from Tesla as needed. The battery is built for daily use – daily cycling of the battery is expected and covered by warranty. At end of life, Tesla is accepting the batteries for recycling at its Gigafactory. Become a green household by reducing your reliance on dirty grid power. Achieve total energy independence and go off-grid using the battery or virtually off-grid by drawing next to nothing from the grid. Read the full case study in PDF format here. 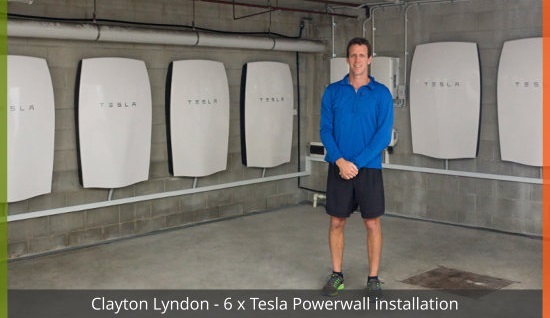 The first Tesla Powerwall battery system to be installed in Australia is impressive enough, a 90% + saving on the power bills is even more impressive. 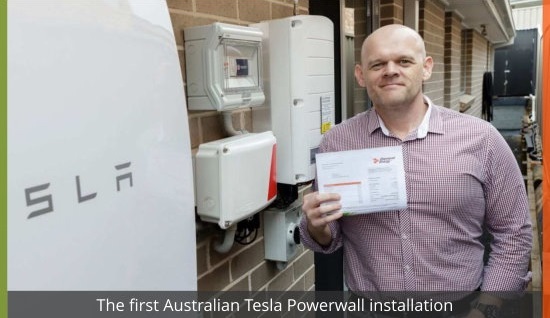 That’s just what Nick Pfitzner from Sydney has experienced being the first Tesla Powerwall owner in Australia and saving a massive amount on his electricity bill. And now this has been analysed by the Australian media in great detail – their verdict IMPRESSIVE! His latest electricity bill in the post, Nick Pfitzner was pleased to see the amount to be paid was a mere $50.39 (Incl. GST). Compare this to his previous bill for the same quarter last year and Nick was facing a bill totalling $660.77 (Incl. GST), which means his family had a saving more than 90 per cent. “As I’ve learned a bit more about the Powerwall, I’ve also tweaked some of the larger hardware pieces to exist in harmony with each other and the solar system in general. For example, the pool pump needs to be running for a certain number of hours per day to ensure cleanliness, and takes about 0.8kWh at standard operation. I’ve worked out the pump capacity (Qmax) and rate of flow correctly, to ensure I use only the minimum hours per day. I also figured out that running it later in the day allows the battery to top up earlier as the panels start cranking up the flow mid-morning. In partnership with this, the timer on both our washing machine and dishwasher are set for the early afternoon, when the sun is at its highest. I leave a gap in the pool timer of 2 hours in the middle of the day so both these devices can run without issue, even when the sun isn’t so bright. Brian Gillespie lives in a part of South Australia close to Adelaide. The area is an energy blackout zone with regular outages to the electricity network. Having already had a solar system installed Brian wanted to add a Powerwall home battery as an addition to his solar. Natural Solar were able to provide the technical skill to install the Tesla Powerwall in an AC coupled backup configuration. With the ever present threat of Blackouts becoming more frequent throughout Australia it is a good to know that a solution has been tried and tested. For Natural Solar customer Brian Gillespie from South Australia it was a complete shock to find out that for the previous three hours the rest of his neighbours had been in complete darkness. Why … because Brian has a Tesla Powerwall and whilst everyone else was suffering from the lack of power he was lighting his home and watching TV as normal. In fact Brian has stated that his Powerwall can stay off-grid for 10 hours without any issues supplying his home with useful energy to run lights and the television. One of the main reasons Brian came to Natural Solar was to purchase a Powerwall, his reasons were to beat the many blackouts experienced in and around the area he lives. However, the state wide blackout was very severe and many 1000’s of South Australian’s were left without power for a considerable time. Brian’s backup circuit in his home is used exclusively for when the power fails and contains his house lights and a few power points for the TV and other smaller electrical appliances. Brian only discovered that there was a power outage whilst watching the news, he said he opened the oven door to see that the light wasn’t working. At the time of installation, in 2016, this was a World record for the most Tesla Powerwall home batteries installed in one property. At 42kWh of energy storage the media described the install at this Gold Coast property as a ‘mini power station’. In reality the installation was the culmination of many months’ hard work and clever electrical engineering to ensure that this system provided the calculated returns. The main solar system features 93 Phono 255W panels and 3 SolarEdge inverters. The home has 3 phase power so each phase was connected to 2 Powerwall batteries each providing a total capacity, when fully charged, of 14kWh per phase. Discharging can be made from one battery at a time, per phase, however, the phases can work together with three batteries in total being discharged simultaneously. The system has also been designed so cheaper off peak energy can be used to charge the Powerwall batteries overnight. This is then used to offset the more expensive periods of energy import from retailers, should it be required. Such scenarios may occur in poor energy producing periods or where panel performance has been inhibited for whatever reason and also to boost savings with multiple daily battery cycles. Complimenting this is the 3 string array of panels, each 8kW. Each array is connected via a smart system to control the energy produced. Savings are expected to be in the region of $13,000 per year, with a return on investment expected between 5 – 6 years. The system was also designed to accommodate the advent of new technologies allowing energy to be sold back to the grid on demand. Such systems offer larger incentives for the energy than the traditional Feed in Tariff (FiT). 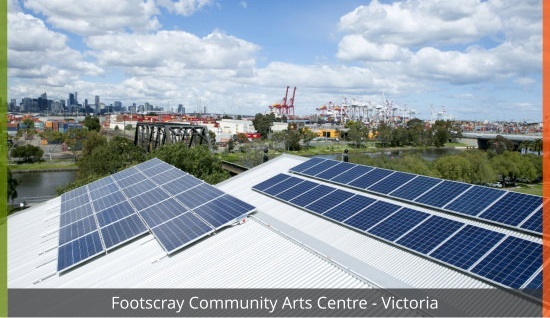 Footscray Community & Arts Centre is the first crowd funded Tesla Powerwall and solar system solution in Victoria. Supplying close to 30% of their energy requirements the 40kW system also includes a 7kW battery storage solution. Predicted savings have been calculated at $14,000 per year with a further total saving of $126,000 by the year 2025, a milestone for the Centre. This in real terms means that money saved can be re-injected into the activities within the centre. Natural Solar worked closely with the board of Footscray Community Arts Centre (FCAC) to get an understanding of how the building uses its energy. Our electrical engineers and energy specialists undertook evaluations and studied the supplied figures & details before tailoring a unique solution. The idea of crowdfunding the project was embraced by Natural Solar and technical elements of the project were released to the managers and board members of Footscray to enable them to put together their funding bid. Installation was assessed and completed by a Clean Energy Council accredited installer and managed by Natural Solar. Calculations made during the design phase of the system suggested that the strings were split into two groups and this was translated onto the roof during the install. To accommodate any upgrade to the system, at a later stage, the panels were laid out in a specific pattern. Measures which had again been included in the electrical design were taken to provide future installers an easy route to add extra panels to the array. The project has been used as an important marketing tool for the Arts Centre and has raised much interest both in the way the project was funded but also for the technology used. The savings will also help fund FCAC’s ‘Call to Create’ program, which provides in-kind venue and producer support for artists and communities to showcase their work. Described as a pioneering move – In general, arts organisations have not been able to consider solar because they don’t have sufficient infrastructure budgets. FCAC has shown that this need not be a barrier. With the help of just a part of its community, FCAC will soon be showcasing its own renewable energy achievements as well as contemporary art. No more energy bills! Woo! How does that grab you? Well a home revolution is here. Sunrise reporter Sean White has been on the case investigating home batteries that can make your own power. Yeah happy hump day, some good news! It’s called the Tesla Powerwall. Essentially, it’s a home battery storage unit and affordable enough that we could have one very soon. Perhaps what’s most remarkable about this story though is that one family in Sydneys North West has seen their power usage plummet to just 0.59c per day. It’s the battery pack that’s built to last. Ahhh yes, this time it’s for your home. A Tesla Powerwall is a battery thats hooked up to your house that allows you to store your solar power for use in the evenings. A battery that can make your own power… Nick Pfitzner from Kellyville in Sydneys North West is the first residential Aussie to have one installed by Natural Solar. Why did you decide to get one? I’ve been very interested in Tesla since I saw their electric cars years ago, and when I heard the announcement last year that they were bringing home storage, I was quite keen to get hold of one. Their home includes four bedrooms, an internal laundry, a pool, an outdoor entertaining area, their personal renewable energy kit includes the Tesla Powerwall, solar panels, a SolarEdge Inverter and a fully integrated bi-directional cloud based monitoring system. Yes, a mouthful. Basically, they can see a full breakdown of the energy from the entire system and the Powerwall. I guess Winter is a time when everyones power bills are powering up. But your power bill, we’re looking at 60c on average a day? So far yes, and Winter might be a bit different, but we’ll have to see how that goes. Whilst the cost reduction renews hope that surging power bills can be battled, it’s worth considering the initial cost commitment you’re signing up for. My system cost about $16,000 to install. So it’s not cheap. 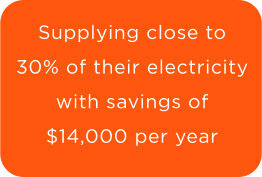 But it’s more about a long term investment, as how much have you saved on your electricity bills? My first bill has gone down by about 90%. It went from $660 to exactly $40.46. The Pfitzner family should expect to see a complete payback period of between 6 and 7 years. This is a complete home and energy integrated solution with the battery, and what it does is really give the user or the household, far greater use, far greater access to that power when they need it, without sending it back to the grid. A giant battery for Aussie homes that makes your own power. A powerful idea that’s now, a reality. 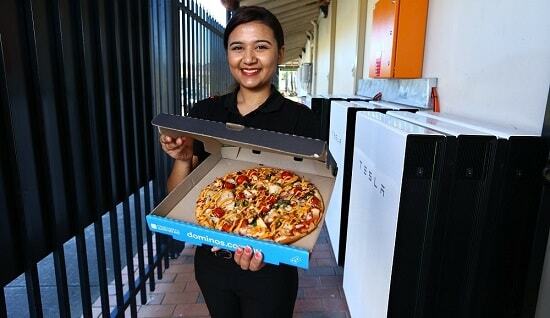 In a world first, Aussies can now have battery powered pizza, with one Domino’s franchise in Sydney’s West now delivering pizza made using battery power direct to customer’s homes, due to their installation of ten Tesla Powerwall 2 batteries by Natural Solar; the largest commercial Tesla Powerwall installation in the world. Chris Williams, CEO and Founder of Natural Solar said the Company was proud to have worked on the largest commercial Tesla Powerwall installation in the world. 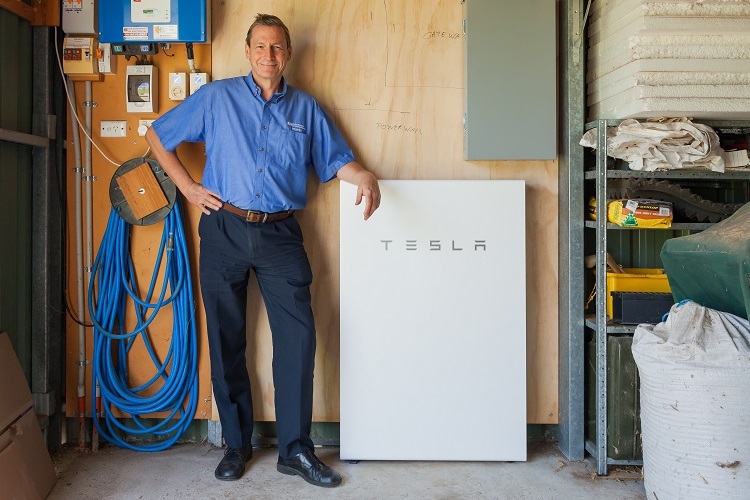 Domino’s Plumpton is the first store in Australia to opt into a renewable energy storage solution, having ten functional Tesla Powerwall 2 units installed which power all appliances including ovens, refrigerators, freezers and lights. The system, which is already functioning, includes 10 Tesla Powerwall 2 units and can store 135kWh in power, which over the course of a year, is enough to cook more than 90,000 pizzas and 27,000 loaves of garlic bread. The newly installed Powerwall 2 system at Domino’s Plumpton will allow the store to charge their 10 batteries from the grid overnight when the store is not in use. This allow the store to use this extra 135kWh of power during the day, without having to change the infrastructure of the grid, allowing the store to meet high demand for hot fresh pizzas. “We are seeing more and more businesses Australia-wide looking for ways to add renewable energy solutions, including battery power, to their operations. In the past 12 months, commercial enquiries for Natural Solar increased by more than 1000%. We are only expecting this to grow as the battery storage revolution continues to take hold,” says Mr Williams. Domino’s CEO Australia/New Zealand Nick Knight said the Company was pleased with the innovative approach used in the new store. “Partnering with another Australian company Natural Solar, it excites me to see Domino’s stores and Franchisees leap at the opportunity to be at the forefront of innovation and technology to support the everyday running of their stores and businesses. “There is no doubt that customers who order their pizza from Domino’s Plumpton are supporting the future of renewable energy and battery power in Australia. At Natural Solar we are looking forward to the sweet taste of battery powered pizza from many more stores around the country,” concluded Mr Williams. Natural Solar is Australia’s largest and leading national solar and home battery installer. Founded in 2012, Natural Solar offers a range of energy storage solutions. A leading authority on the Australian renewable energy industry, Natural Solar installs both residential and commercial solar and battery solutions. The second generation of Tesla Powerwall is the most affordable home battery in terms of cost per kWh. Powerwall economically meets the daily needs of the average family household. It has a long life due to its liquid thermal control system regulating Powerwall’s internal temperature to maximise battery performance in even the harshest Australian climates. To top it off, it also has in integrated internal inverter to convert DC energy to AC energy which is what your household runs on, which lowers the cost of installation and complexity of installation. Why choose Natural Solar for your solar and battery storage needs? 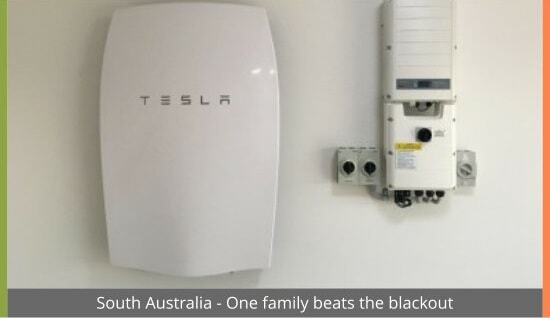 What makes Tesla Powerwall the ideal battery storage for your Australian home? Australia has one of the highest electricity prices in the world, and it’s increasing at a steady pace too. We have an abundance of sunshine too, which makes Tesla Powerwall a no brainer for both homes and small businesses. Powerwall 2 is built with Australia in mind to combat this. It meets and exceeds all safety requirements for Australian lithium-ion solar power batteries, meaning it can be installed anywhere across Australia. The 13.5kWh solar battery is specifically designed with the average Australian household or small business in mind, with the specific intended use and the ideal chemical lithium-ion composition for the battery to be charged and discharged (cycled) on a daily basis. Get a sonnenBatterie quote in 60 seconds!